Provide comfort for the family of Betty Jane Baker with a meaningful gesture of sympathy. WASHINGTON AND BANGOR Betty J. (Jones) Baker, 90, passed away quietly February 4, 2019 at a local hospital aer a brief illness. She was attended by her dear granddaughters, Christina Lizotte and Sue Borden, who were constant companions for the entire time. 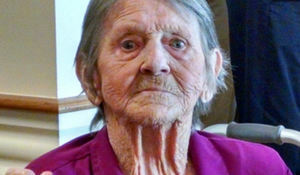 Betty and her husband Mike lived in Hermon for over 50 years raising their three children. She spent many years manning the concession booth at the old Bangor Auditorium, and prior to retirement, Betty and Mike owned Frost's Market on Main Street in Bangor, working 12 hours a day, 6 days a week. She was a member of the Hermon Baptist Church prior to being admitted to assisted living in 2015. Phillip and John Jones, and best friend Florence Ross. 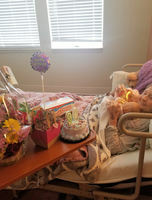 She is survived by daughter, Janice Reed and husband, Thomas Reed; daughter, Jean Baker; son, Michael J. Baker, Sr.; 6 grandchildren; 11 great-grandchildren; 7 nieces and nephews, and one "other son" Byron Basque. Relatives and friends are invited to call from 5-7:00 p.m. Friday, February 8, 2019 at Brookings-Smith, 133 Center St., Bangor where a funeral service will be held 3:00 p.m. Saturday, February 9, 2019 with the Rev. Garnett Chute, pastor of the Hermon Baptist Church, Oiciating. Spring interment will be held in the Pleasant Hill Cemetery, Hermon. Society P.O. Box 42040 Oklahoma City, OK 73123. Provide comfort for the family of Betty Jane Baker by sending flowers. Janice : Please accept my most sincere condolences.